I made this fabulous little magnetic board for my daughter for Christmas. It turned out so much cuter than whats available in stores and was less expensive too. My daughter loves to hang all her pictures and art work up on her new board. I used a 16 x 20 inch frame that I found on clearance earlier in the year. Garage sales are also a great place to look for frames. 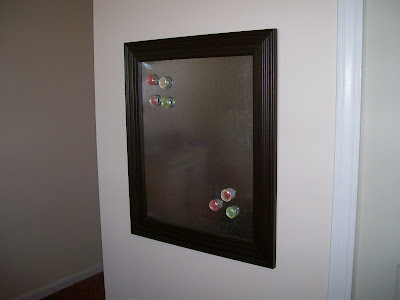 I took the glass out and replaced it with sheet metal that I picked up pretty inexpensively from the Home Depot. You'll need to have some tin snips to cut your metal to fit the size of the frame. Make sure to bring a magnet along with you when buying your sheet metal. Not all of it is magnetic. If you don't like the shiny look of the sheet metal cover it with white or decorated contact paper. The magnets were fun to make. This is where you get to be a little more creative. 1. 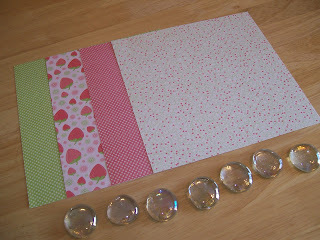 Trace the stone onto the scrapbook paper. You'll want to cut it out a little bit smaller than what you trace. 2. Spread a thin smooth coat of glue stick onto the design side of your cut out circle. Place the stone on top. 3. Apply tacky glue to magnet and adhere to paper on back of stone. Allow to dry well before using.